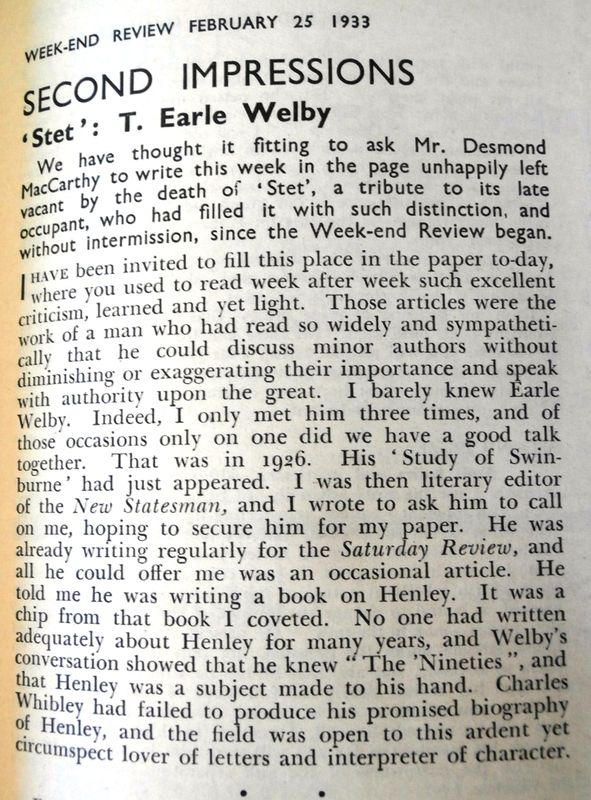 Thomas Earle Welby, born in India in 1881, was brought up by eccentric (enlightened?) parents not to speak English until he was six. He was educated in England but spent most of his years therafter working as a journalist in India, and in 1916, as a war correspondent in what we would now call Iraq (Mesopotamia). 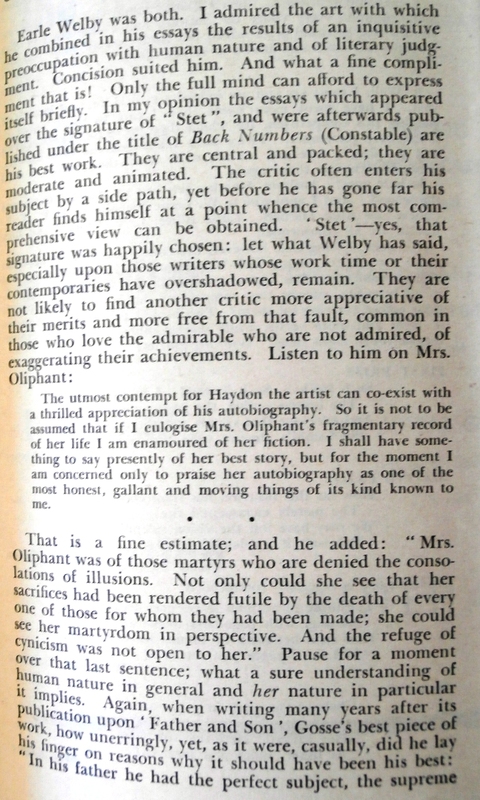 He was was best known for his literary criticism and literary journalism, especially under the pseudonym ‘Stet’, in which, both in ‘The Saturday Review’ and ‘The Week-end Review’ (he was to die in 1933, having filed his copy on the same day he died) he passed a thoughtful and lucid judgment on a wide variety of writers, although his specialities were Swinburne and Landor, and also poets like W.H.Davies. His life of Swinburne can be downloaded as a pdf file here. 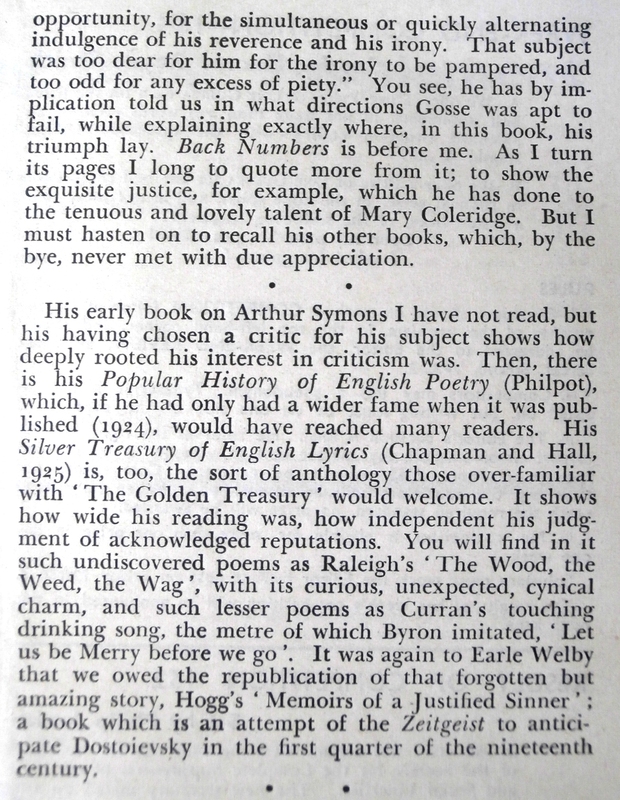 He produced two anthologies that tried to reclaim some forgotten poems for a new audience; and he was an enthusiast on the subject of Arthur Symons. 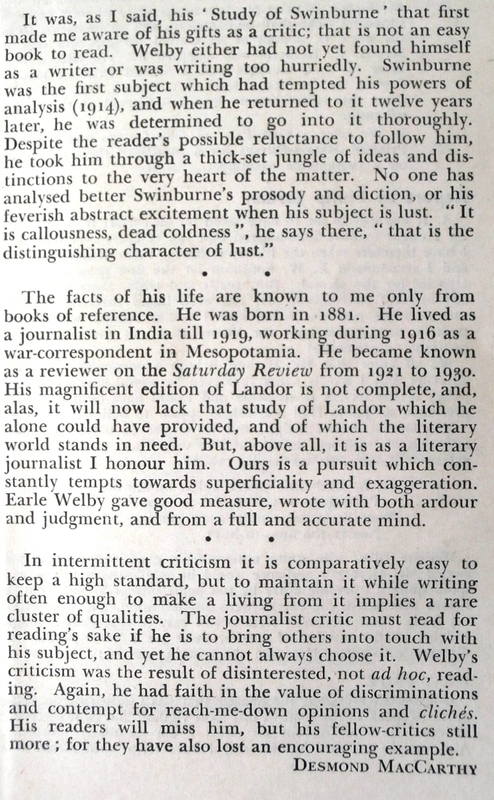 He was a highly readable columnist, but absorbed in reclaiming the minor writers of the late nineteenth century – he was not hostile to new writers (unless claims were made that they were better than the writers he knew best), but he was essentially a Victorian and Edwardian in his taste. 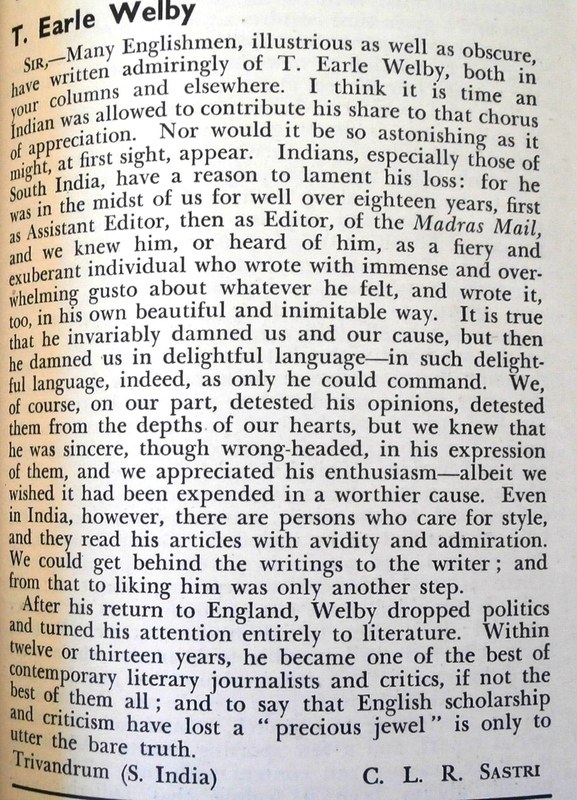 New writers, according to a biographical piece by Edward Shanks, included Robert Bridges and Thomas Hardy. 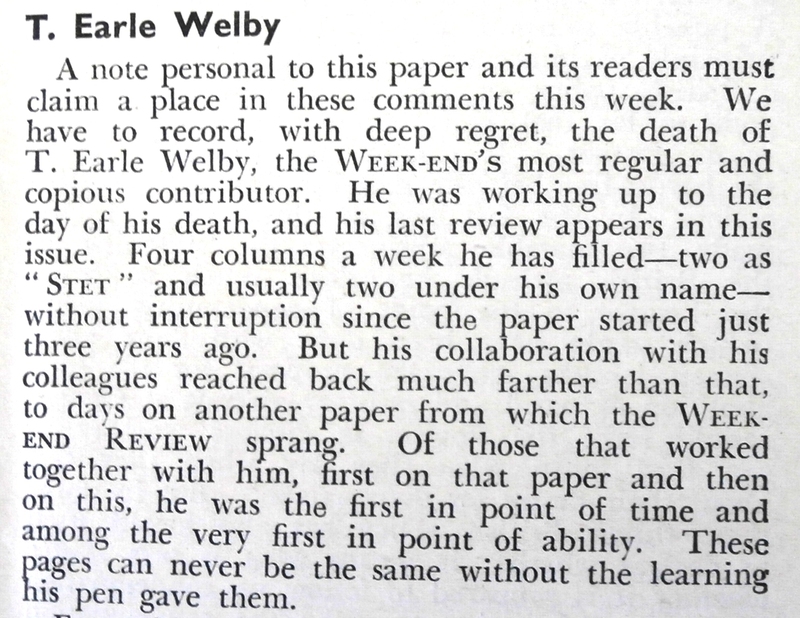 Politically, he was to the right – the biographical note that introduces his posthumous collection has a hard job explaining away Welby’s hostility to the idea of democracy (it might be noted that he was admired enough as a writer for it not to bother Barry that he continued to work for ‘The Saturday Review’). Not unlike Robert Lynd, he was always late. He enjoyed conversation, and was known for a mannerism whereby he used a ‘sideways movement of his hand for emphasis, which, since it was often associated with his reminiscence of India, was described by a wit as “the Calcutta Sweep” ‘. 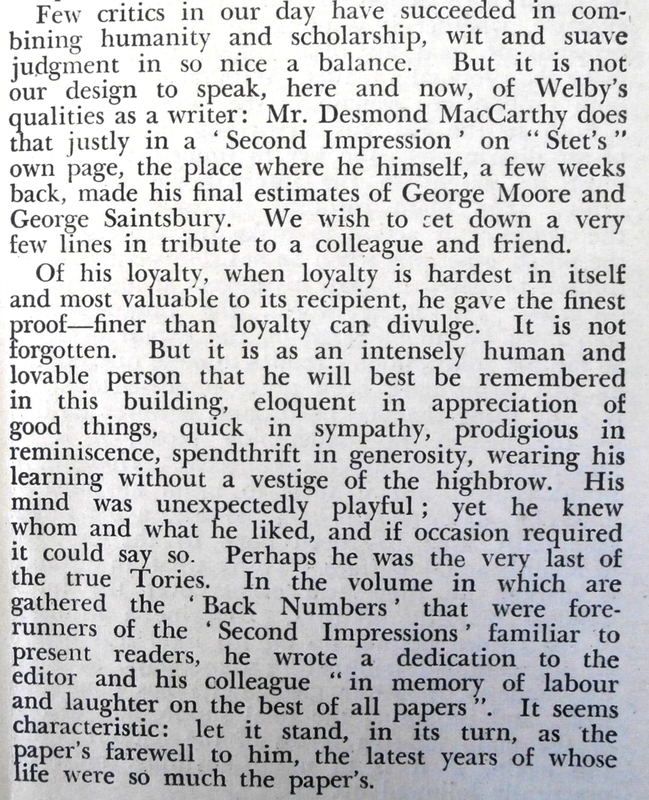 A possibly apocryphal story circulated about him that he had once organised a lunch for a literary figure he admired, to which he (Welby) turned up late, and to which he forgot to invite the guest of honour. When going to ‘make a telephone call’ to the supposedly very late guest, he was observed by one of the hungry invitees simply standing by the phone for as long as it would take to make a call, before returning to say that there had been a mix-up. However, he was just as interested in writing playful and facetious pieces, as in this brief extract from a survey of cheese (he was an enthusiastic cook, and had been a friend of Escoffier). It’s from The Dinner Knell (1932). Made of skimmed milk and herbs. Thanks a lot – only just seen the comment. Really kind of you.